Monday. Gymnastics, death by hspu. Result, 55 reps. Metcon, 6rds of: 300m row, 10 burpees. Time, 11.03. It's been ages since doing "death by" workouts for the previous time. The idea is that you put the clock on, and complete one rep on the first minute. Two reps on the second minute, 3 reps on the 3rd min and so on. It ends when you can't finish the reps needed within one minute. My shoulders felt yesterday's push jerks already before this session began so it was challenging enough to smash these handstand push-ups. It was easy in the beginning but once it gets taxing, the difference is suddenly quite big compared to the previous minute. It was somewhere at probably 7 reps that I felt it's gonna be tough to get 10 minutes done. Had to break the reps on the last rounds but still got the work done. I had decided to have a short training session so I basically jumped on to this with just short recovery. I was sweaty already so why waste time as you can also hit it right away. This was a good wod indeed. Rowing and burpees never fail. 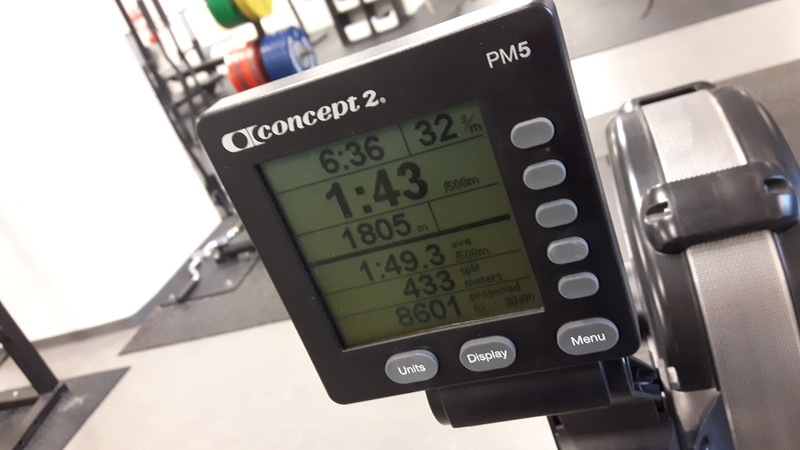 Rowing was 1:40+ and from there I walked couple of meters to my burpee area. The strategy was to walk those few steps deliberately and start working the burpees right away. No standing still and waiting the breathing to settle. And after burpees I walked back to the rower and took the first stroke immediately. Then adjusted the foot handles during the process. Focus was on these transitions today.